On rare occasions, I will crave something sweet. Tonight, I wanted chocolate cake, but who has time to bake a cake? Enter the magic mug cake! And the beauty of this from-scratch, 5 minute 45 second baked cake is that I can control the sweetness level. 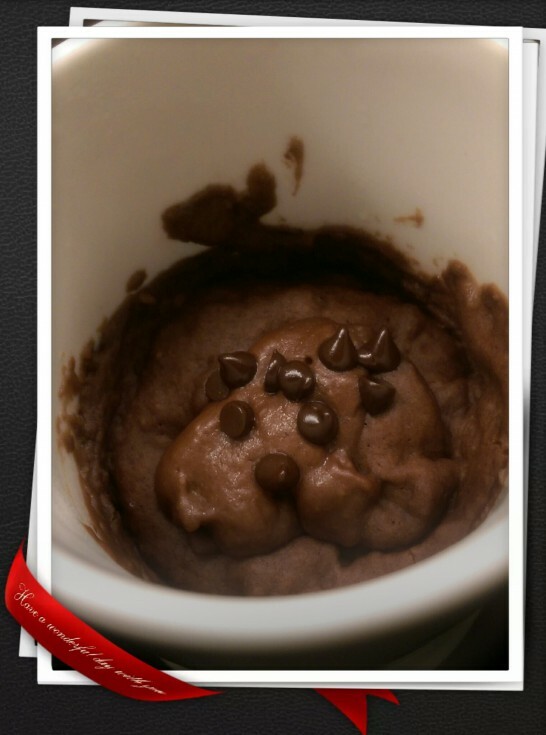 In a 250 ml (1 cup)-capacity coffee cup, combine the flour, sugar, cocoa powder, and baking powder. Add the milk, oil, and vanilla. With a fork, gently stir until the batter no longer has lumps. Sprinkle with the chocolate chips. Cook the cake in the microwave for 45 seconds. Let cool for 5 minutes to allow for the cake to finish cooking. If you want to do more, triple or quadruple the recipe and combine the ingredients in a bowl. Then spread the mixture into three or four cups or 125 ml (½ cup) ramekins. Remember, you have to cook the cakes one by one in the microwave for uniform cooking.